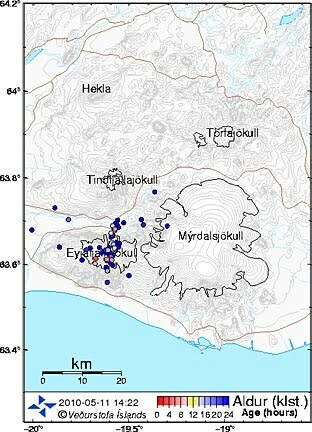 The level of earthquakes around Eyjafjallajokull has increased again, but there is also this extension of the earthquake patterns that started by moving north and now is hooking around towards Katla, which is under Myrdalsjokull. Given that the earthquakes are generally indicative of some form of rock failure at the source this could be the start of a connective path to Katla. On the other hand there haven't been any larger quakes in a couple of days and these seem to be fairly deep still. Update: Based on a recommendation from Eruptions, below the fold I have added a couple of graphics from the Chicago Tribune that could be helpful. 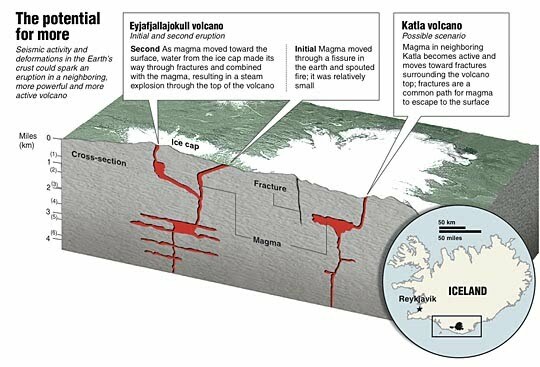 The first is a graphic showing that the last two times Eyja went, so did Katla (it is actually three if you go back far enough). And the second shows how the magma chambers between Katla and Eyjafjallajokull are possibly oriented. Much of the current activity seems to be down around the 4-5 km deep zone, where the graphic shows the magma chamber under Eyjafjallayokull which might be reaching out laterally to Katla, though this is all only conjecture at this point.